A tremor of fear runs through the population in the streets of Hong Kong. Word is out that a recent string of murders may have been committed by one of the very investigators charged with solving them. The police are bringing in more help. Behind the scenes, the killer is recruiting too. In CS Files: Undercover Allies, new roles give special powers to both teams. More means and clue cards increase the possible solutions to the crime. Fresh scene tiles bring more life to the forensic scientist's descriptions. And a new event challenges the already tenuous trust which exists among the investigators. 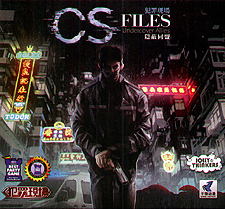 You need the CS Files base game to play this expansion.